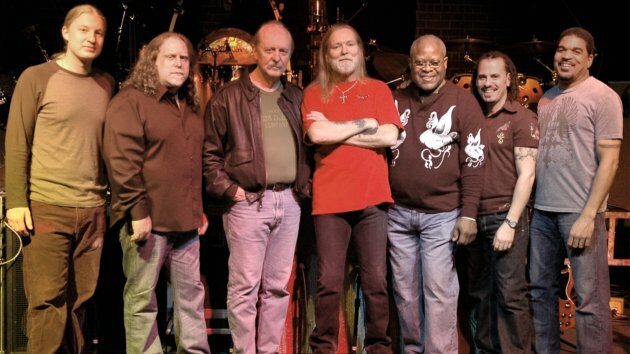 The Allman Brothers have just issued the digital version of “The Fox Box”, an 8-disc set spanning a run of three shows at Atlanta’s Fox Theatre in 2004. Originally offered via the then-new "Instant Live" program – where fans could order a recording of the performance and leave the venue with the audio cd afterwards – “The Fox Box” provides a remastered audio mix of the Atlanta concerts. The project delivers 53 songs over three shows with only one repeat, “Dreams”, which appears each night featuring a different guitar soloist – Derek Trucks, Warren Haynes and Jack Pearson. The 2004 lineup of the Allman Brothers Band included founding members Gregg Allman and drummers Butch Trucks and Jaimoe, along with percussionist Marc Quinones, guitarists Warren Haynes and Derek Trucks and bassist Oteil Burbridge. Guitarist Jack Pearson, who was in the band from 1997 to 1999, was a special guest. Other guests included Derek's Tedeschi Trucks Band bandmate and wife Susan Tedeschi, Butch's son Vaylor Trucks and keyboardist Rob Baracco. A full track listing for "The Fox Box" can be found below. After 45 years together, the Allman Brothers Band performed its final show on October 28, 2014 at the Beacon Theater in New York City. On January 24, Butch Trucks died of a self-inflicted gunshot wound at his home in West Palm Beach, FL at the age of 69. Gregg Allman recently cancelled his live schedule for 2017 without explanation.